College is all about balancing responsibilities, time management, and pursuing your passions. 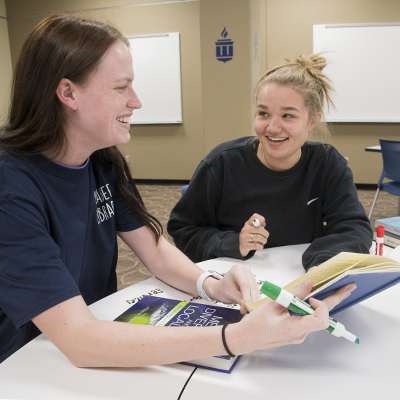 On-campus student employment provides Ichabods opportunities to work around hectic schedules, gain valuable hands-on work experiences, and utilizes your degree and/or learn more about other degrees that may be of interest. We have two different categories of student employment and a variety of positions available. Must complete a FAFSA by November 15 priority date. Awards based on eligibility and availability of funds. Earn up to $3,000 per academic year through bi-weekly paychecks. Earned money can be used for educational, living, or other expenses. For award to last the entire academic year, it is recommended students work 10 to 15 hours per week. Graduate, Law, and International students do not qualify. All students qualify for these positions. Money earned can be used for educational, living, or other expenses. A sophomore from Palo Alto, California, Patty Hernandez-Lopez epitomizes what it means to be a student employee and a LinC Bonner Scholar at Washburn. Having already earned her CNA at Washburn Tech, Patty who is a first-generation Ichabod Success student, has taken advantage of Washburn's student employment opportunities with the LinC program to get hands-on, paid experience before applying to Washburn's School of Nursing. For the past year Patty, has worked at the Pine Ridge Family Health Center, helping the center expand its outreach in the community. This past spring and summer she organized and ran an HPV clinic through Pine Ridge. She also works to translate the center’s materials from English to Spanish to improve the accessibility of the services. Kristine Hart, Patty's on-campus supervisor, states, "after only one year with the program, I have seen Patty really start to become more outgoing and she is constantly taking on new challenges and opportunities with her site." Her experience working through LinC, which places students in off-campus organizations and non-profits, has helped mold her plans after graduation. 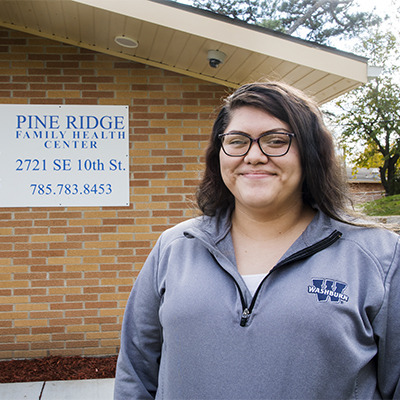 Patty stated that after graduation her plan is to either work at a hospital or a smaller clinic, similar to Pine Ridge, where she can help low income communities. 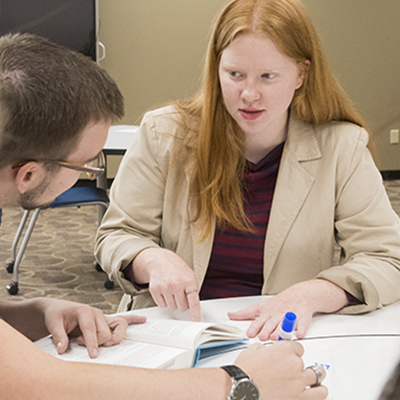 One of the most popular federal work study positions at Washburn is with Learning in the Community (LinC): The Center for Community and Civic Engagement’s Community Corps program. 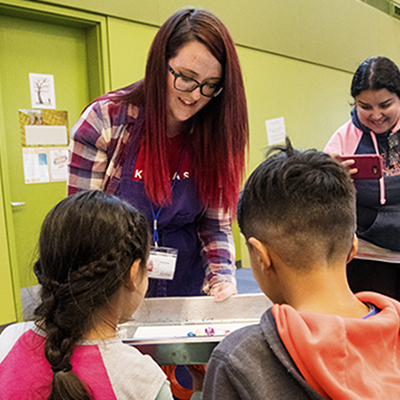 Each year, LinC places over 100 students with community-based sites where individuals can engage in work that matches their academic, professional and/or personal interests and approximately 50 of those students are LinC Community Corps members. LinC fosters relationships with a variety of non-profit organizations and local schools to ensure that they have student employee positions that fit most, if not all, of the available majors at Washburn University. If you use federal work study with LinC, you have an opportunity to get an added academic accomplishment on your transcript for your community-based work through the Community Service Washburn Transformational Experience program. In other words, if you are looking for a federal work study position where you can get real world, hands-on experience in your field (or explore a field you think you are interested in) while making a difference in the community and be recognized academically for your work, LinC is the place to be! For more information about the unique opportunities available within your major and/or area of interest, contact Kristine Hart. Federal work study is a student financial aid program for eligible undergraduate students with unmet financial need. With federal work study, students can get a job on campus and earn money through working. Paychecks can be used for educational, living, and/or other expenses. Funds are not directly applied to tuition, fees, or remaining balances. Where can I work with federal work study (FWS)? Washburn University has student employees in almost every department on campus, as well as community service jobs off-campus. It is up to the student to find their own position. You can find all vacant positions here. How do I apply for federal work study (FWS)? Where can I find out if I have been awarded federal work study (FWS)? You will find your federal work study award on your award letter, which is mailed to first-time students, and/or on your MyWashburn account, for returning students. Your award(s) will be located under the financial services link, located on the left side of the page. I was not awarded federal work study (FWS). What should I do? You can contact the Student Employment Coordinator to check your eligibility. If you qualify for federal work study, you will be placed on our annual wait list. Students on the wait list are awarded if we have remaining funds and then awarded based on the date the FAFSA was completed. Can I work on campus if I do not have federal work study (FWS)? Yes, you can work in a departmental position. You can review vacancies here. The best time to look for a fall position is July 1 after New Student Orientations have been completed. Vacant positions will be posted on July 1 and will continue to be added to the website as they come in from departments. New Student Orientation is a great way to find out about potential job vacancies. If you are seeking employment for the spring semester, you can begin searching for a position any time in the fall semester. Positions are added to the website on a daily basis. Once I start working, how do I get paid? Yes, international students with an F-1 and/or J-1 visa may work on-campus and would follow the same process as a US citizen to apply for a job. Once an international student receives a position, they will need to contact the International Programs Office to receive a work permit and a letter to take to the Social Security Administration to request a social security number. ﻿Yes, there are off-campus opportunities that are posted on Handshake. These are positions that are within the community but not affiliated with Washburn University. If you have questions about internships, off-campus opportunities, or resume assistance contact Career Services.